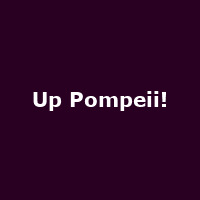 "Based on the original characters from the Frankie Howerd BBC comedy, this hilarious romp through ancient Pompeii brings back all the television favourites in this full-length play seen on a national tour in 2011. As Senator Ludicrus Sextus's slave ,Lurcio attempts to deliver his prologue and begin proceedings, he is quickly caught up in the myriad of sexual liaisons in all quarters of his master's house. Why does Ludicrus not leave for the Senate meeting in Rome? Why does his wife return so quickly from the country? Who will take care of the escaped slave girl, Voluptua, and will Nausius's love poetry improve? Whilst growing chaos ensues, an increasing rumbling is heard in the distance - what could that possibly be?"